Baby Hazel is learning good manners from her friends and family members. Its parents who are child's first teachers and this apply for little Hazel too. As she is grown up her mom thinks that Baby Hazel should be aware of all the norms concerned with social life. Her mom begins with physical exercise to keep her chubby baby fit. Later she wants Hazel to know about kitchen manners. Hazel should also build up social manners with different aged group people. Help darling Hazel know all about these decorum for being responsible person. It's bright sunny morning and mom has woke up early for workout. But darling Hazel is still enjoying dreams on her cozy bed. Help mom wake her up and get ready for workout session. Little Hazel feels it tiresome but you make sure she does all the workouts perfectly along with her mom. Hazel is done with her workout and now she is in kitchen along with her mom. Mom decides to make her kid learn dos and don'ts of the kitchen. Help Hazel learn manners required to maintain in the kitchen. Uncle Sam along with his daughter, Kayla will be visiting Hazel's place. With this date, mom decides to make her learn etiquettes concerned with respecting and bonding with others. Initially, Baby Hazel is very uncomfortable with Kayla's presence and attention she is getting. Help Hazel befriend with her for great bonding. They all are done with dining and now it's time for kids to play. Mom and Uncle Sam are busy chatting while these kids ae engrossed in playing. Help these kids play and bond well. This will help Hazel learn sharing her belongings with others without hesitation. 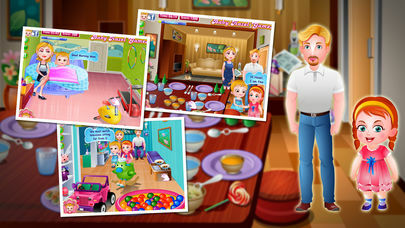 Play Baby Hazel Learns Manners game for free. For any child, her home is the first school. It is with Hazel too. Baby Hazel is learning good manners from her friends and family members. Are you interested in helping Hazel to be a well behaved kid? If yes, here you go. As a first thing, help her to inculcate healthy habits to keep one fit by physical activities. Then during breakfast time, teach her essential kitchen safety tips. 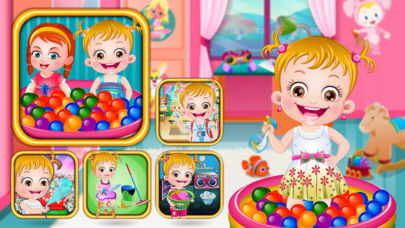 Later teach good manners to Baby Hazel through a fun filled play date. Call a friend home to play and dine so that she can build social skills and good manners towards friends and adults.